Your Student Record is different from your official transcript because it includes details like dean’s office notes, which are not part of the transcript. The transcript is printed on security paper or encrypted as a secure PDF so other organizations can trust that it is authentic. 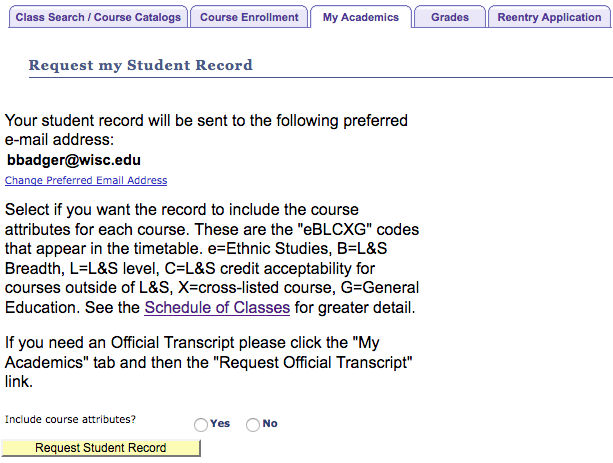 The Student Record is a plain PDF that you can easily get yourself, when you need a summary of your academic history at UW–Madison. Students enrolled in a term from Fall 2010 to present: go Student Center via MyUW. Students enrolled in a term from Fall 1979 to Summer 2010: go to Student Center via MyInfo. 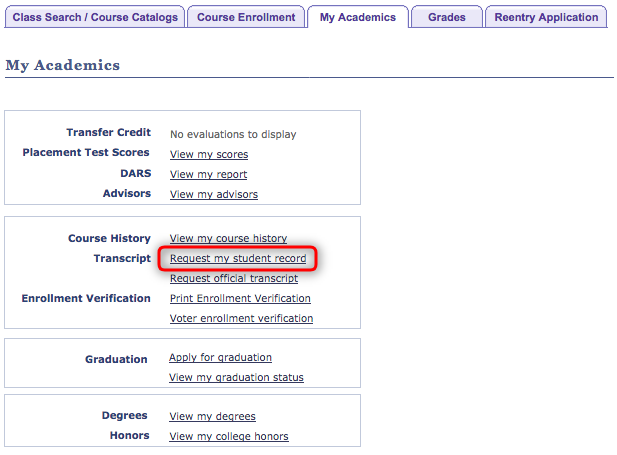 Select the “Request Student Record” button. An email will arrive in few minutes from the Office of the Registrar, with your Student Record attached as a PDF. If you are unable to access Student Center, you can request a Student Record in person at our office. Picture ID, preferably a student ID, is required. There is a limit of one copy per student per visit; however, they are printed on plain paper and you can easily make your own copies.